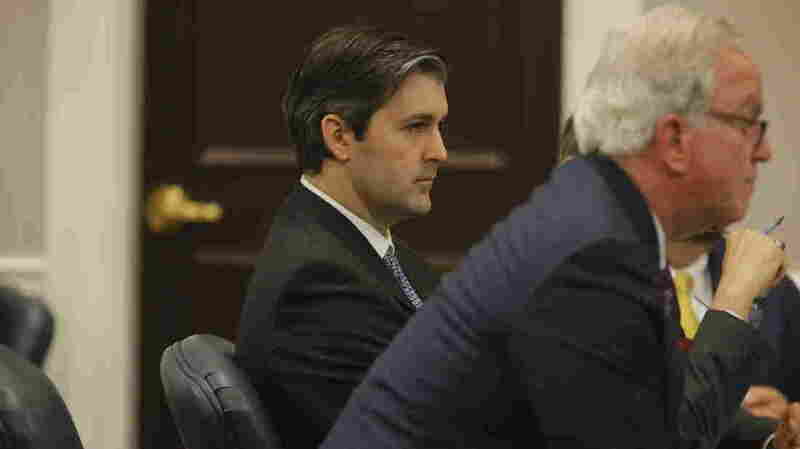 Michael Slager, Ex-Officer Who Shot Walter Scott, Sentenced To 20 Years : The Two-Way A federal judge ruled Michael Slager committed second-degree murder and obstructed justice in his 2015 shooting of Scott, an unarmed black man. Slager pleaded guilty to violating Scott's civil rights. Former police officer Michael Slager, seen during his state murder trial last year in Charleston, S.C., which ended in a hung jury. Slager, 36, "acted out of malice and forethought, shooting dead an unarmed and fleeing Walter Scott," U.S. District Judge David Norton told the court Thursday after several days of testimony, according to the Charleston Post and Courier. "Slager's actions were disproportional to Scott's misconduct." In a wrought courtroom scene, Scott's mother, Judy, told Slager that she forgives him for her son's killing. As South Carolina Public Radio's Victoria Hansen reports, Slager turned to her and silently mouthed, "I'm sorry." In April 2015, Slager had pulled over Walter Scott because of a broken brake light on his Mercedes-Benz. What was supposed to be a routine traffic stop turned deadly. The 50-year-old man ran from his vehicle and Slager gave chase. The two scuffled and Slager opened fire as Scott was running away, hitting him five times in the back. The incident, which ended in Scott's killing, was captured on cellphone video by an onlooker. That video quickly went viral, drawing national attention to the case. The North Charleston Police Department fired Slager after the footage surfaced publicly. Slager's path through the courts has been convoluted. A state murder trial ended in a hung jury in December. State prosecutors were set to retry him earlier this year, but as part of a plea agreement, Slager pleaded guilty to a federal civil rights violation for using excessive force and South Carolina agreed to drop the murder charge. "Norton had two options for the underlying offense that could affect Slager's penalty: voluntary manslaughter or second-degree murder. Prosecutors have supported the murder finding, which would expose Slager to up to life in prison. But defense attorneys said Slager was provoked into firing, making his actions voluntary manslaughter." Slager had claimed that Scott had wrested his stun gun from him, and that he fired his gun in self-defense. But Norton did not buy that defense.